Why would I use an antibacterial regularly on my skin? What is your idea of a health regimen? What is a Quaternary Ammonium Compound? Why hasn’t this technology come out before? How long have QUATS been used? What does the FDA say about this product? Does this product kill viruses? Do any of your products kill the Avian Flu Virus? How do PureWorks products kill germs? Why do many people say we cripple our immune system by using anti-bacterials? Can I use PureWorks Antibacterial Foam on my children safely? Is this product an antibiotic? Does this product use pesticides? What are the super bugs that I keep hearing about? Will this product kill my “good bacteria”? How should I apply this product? Do alcohol based products have persistence? Why not use 100% alcohol instead of 62% alcohol? How does alcohol dry the skin? Are alcohol products effective at all? Does this product get absorbed by my skin? How does a QUAT kill a bacteria cell or virus? Will your product kill the body’s cells as it tries to heal a wound? Does this product sting in wounds? Can your lotion be used as soap? Do you hold patents on these products? Your lotion says that it is alcohol free, but it states alcohol in the ingredient list. Why? Are the inactive ingredients listed by quantity or alphabetically? Developing a regular use regimen is the only way to kill the germs that you come in contact with effectively. It does you very little good to kill germs in the morning or afternoon but not at night or in specific environments or situations. One of the most important reasons to use PureWorks skin care products is to help generally promote good skin health. Clean, healthy skin is the best defense against skin infections. The gentle emollients in our products help moisturize the skin and make it feel soft and supple, thus helping to avoid the discomfort of dry, cracked skin that is often more susceptible to the risk of infection. Personally, I use the product line many times per day. I use it in the shower after I shower, before I eat, after using the restroom, after any visit to Doctors’ offices or hospitals I use it on my face after shaving and on my feet morning and night. I have discovered that the product makes my skin feel soft and smooth. When my skin feels great, I feel better. Persistence is the ability of the product to have staying power and kill germs for an extended period of time. Our product last for hours on your skin affording extended protection and promoting healthy skin for hours after application. The term, pathogen, is derived from the Greek pathos meaning “suffering.” Today, the definition of a pathogen is a parasitic organism that causes disease in its host organism. Flu, colds, and infections, are examples of diseases caused by pathogens. In chemical terms, cationic means “positively charged.” Quaternary ammonium compounds, like those found in many of the PureWorks products are cationic. This positive charge is partially responsible for the attraction of these ingredients to the skin, which possesses negatively charged molecules. This attraction to the skin is the reason for the quaternary ammonium compounds’ persistence, or lingering presence. This can result in prolonged protection and conditioning of the skin for an extended period following application. Quaternary ammonium chlorides occupy a unique niche in the world of antimicrobial compounds. They are a diverse, eclectic collection of substances that share a common chemical motif, namely a molecular structure containing a positively charged nitrogen atom covalently bonded to four carbon atoms. This quaternary ammonium group is responsible for the name of these antimicrobial compounds and also plays a dominant role in determining their chemical behavior. medical products such as cough syrups, high-protein drinks, and skin care products. It is safe and imparts unique attributes when formulated into such products. Propylene glycol is much different than ethylene glycols. The term “glycol” actually refers to organic chemical structures that contain twin hydroxyl groups on neighboring carbon atoms. This common functional group is present in many different kinds of molecules. For example, all food carbohydrates contain glycol groups. Ethylene glycol is a toxic glycol used extensively in aqueous cooling systems (such as automotive “antifreeze” to prevent freezing in cold weather). Propylene glycol is very different, containing an extra carbon atom in its chemical structure that dramatically changes its chemical and biological properties. Unlike ethylene glycol, propylene glycol is safe for use in both topical and internally-consumed products. Although quaternary ammonium compounds have been around for decades, they present unique challenges to formulating chemists. Each unique quaternary ammonium compound exhibits its own level of anti-microbial activity and is affected differently by the chemical ingredients they are combined with during formulation. Some components reduce their activity, while others may synergize efficiency or expand the spectrum of their activity against various micro-organisms. Years of research and testing were required to produce the highly-effective PureWorks products we have today. The first QUATS were introduced almost one-hundred years ago. Similar to soap molecules, but with an opposite charge, they were sometimes called “invert soaps.” Over the years, a multitude of QUATS have been synthesized, generating a wide variety of these useful compounds. QUATS are formulated into many different types of products ranging from hair conditioners and sophisticated skin care products to cleaners and disinfectants. All PureWorks products are compliant with the governmental regulations where they are sold. In the USA, their topical skin-care products are compliant with the FDA regulations governing these products. PureWorks’ Hard Surface Disinfectant is officially approved by the US Environmental Protection Agency (EPA). In fact, PureWorks products are registered in every state where they are sold. Similarly, each regulated product shall be properly registered and shall comply with appropriate regulations in the country where it is sold. PureWorks’ One-step Hard Surface Disinfectant kills a wide variety of viruses, including Hepatitis B virus (HBV), hepatitis C virus (HCV), Herpes Simplex virus Types 1 and 2, HIV-1 (the AIDS Virus), Invluenza Type A, Respiratory Syncytical Virus (RSV), Vaccinia (Pox Virus), It is also effective against animal viruses such as Avian influenza Virus, Avian Infectious Bronchitis Virus, Canine Distemper Virus, Newcastles’ Disease Virus, and Pseudorabies Virus. In addition, this product is active against a broad spectrum of bacteria, fungi, and molds. Yes, the PureWorks’ One-step Hard Surface Disinfectant inactivates both the “Avian Influenza Virus” H5N1 and the “Avian Infectious Bronchitis Virus.” These claims are proven by extensive testing and are approved claims as allowed by the US Environmental Protection Agency (EPA). All PureWorks products contain the powerful disinfectant active ingredients called quaternary ammonium compounds or “QUATS.” QUATS are positively charged molecules with relatively long hydrophobic “tails.” These molecules destroy bacteria by destroying their outer membranes and literally dissolving bacteria. At lower concentrations, QUATS interfere with normal membrane function, rapidly killing the bacteria. QUATS kill viruses by binding to their external coats, preventing normal function or even denaturing their protective coatings. QUATS are highly effective, quick-acting germicidal agents that are not toxic to humans or animals. The word immune is derived from the Latin immuno, meaning “safe” or “free from.” Naturally acquired active immunity begins after birth, as the body develops antibodies to protect it from invading pathogens. Throughout life, the immune system continues to sense and respond to such invasions. Immunity is the result of the immune system’s ability to produce antibodies to pathogens that it has previously encountered, often following a past illness. People mistakenly believe that if they kill the germs that they come in contact with on a daily basis they will somehow weaken their immune system. There is no scientific data to support that claim. In fact, some diseases are so aggressive that the patient may die before their immune system can respond. Or, since pathogens are constantly changing, immunity based upon earlier infections may not respond to the new pathogen. Perhaps the question one should ask is, “Why should I have to get sick to develop immunity for the next infection?” By employing a health-conscience regime of hand washing, proper diet, and appropriate use of disinfects, a person may help to avoid infections. This is particularly true for infections of the skin, where infectious bacteria can invade small cuts or scrapes. PureWorks Antibacterial Foam and Antibacterial Lotion are excellent first aid antiseptics, helping to protect against the risk of infection on the surface of the skin, where antibodies are slow to respond. PureWorks products add valuable dimensions to assist the immune system in helping to prevent infection. Yes. Our entire product line is designed to be used several times per day. We recommend at least 10 applications per day. For example, PureWorks One-step Hard Surface Disinfectant should be used to disinfect surfaces in the kitchen before meals and clean up tables, chairs, and cabinet tops after eating. Apply to doorknobs, railings, and other surfaces where frequent hand-contact occurs. Since flu viruses can survive on such surfaces for hours, make it habit to disinfect these surfaces multiple times every day. Frequent application of the PureWorks Antibacterial Foam and Antibacterial Lotion conditions the skin, making it feel supple and soft. Many customers comment that frequent application makes their skin feel noticeably better than before they began using the products. 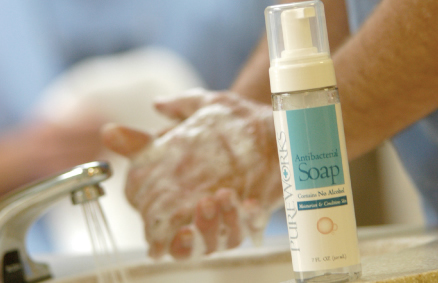 Of course, frequent hand-washing with PureWorks’ Antibacterial soap also helps to keep hands clean, helping to prevent the spread of disease. PureWorks’ Antibacterial Foam is safe for use on adults and children. We believe that this product is the best product on the market for children. It does not contain flammable alcohol and does not burn in cuts and scrapes. It does not absorb through their skin, but stays on the surface, affording extended protection even with their active lifestyle. Kids love the look and feel of the product and actually have fun applying the foam and applying it to their skin. Of course, caution must always be used for any product when applying to young children, especially if they can not communicate their dislike of a product. Never apply any product to young children that may cause any discomfort, and if you sense any negative reaction, stop using the product immediately. No it is not. It contains no antibiotics. Antibiotics are inhibitors of specific metabolic pathways in living organisms. PureWorks’ products dissolve bacteria and as such are not technically classified as antibiotics like penicillin, tetracycline, triclosan, and the like. None of the PureWorks topical skin care products are pesticides, nor do they include ingredients that are considered pesticides. Under laws in the USA, all hard-surface disinfectants are classified by the government regulations set forth by the Environmental Protection Agency (EPA) as “pesticides.” Due to its required registration, PureWorks’ One-step Hard Surface Disinfectant falls under this regulation. In other countries, this same product is not classified as a pesticide. This is a major concern in the health care industry. People call certain strains of bacteria that have mutated and developed a resistance to antibiotics “super bugs” or “super germs.” Examples of these bacteria include Methicillin-resistant Staphylococcus aureus (MRSA), Vancomycin Intermediate Resistant Staphylococcus aureus (VISA), and Vancomycin Resistant Enterococcus faecalis (VRE). PureWorks One-step Disinfectant is highly effective at killing all of the organisms and affords the best protection available against these organisms as well as a broad spectrum of other infectious organisms. No it will not. Your good bacteria are inside your body, generally in your digestive tract. Since no one should ever drink our products, you will not be affecting the “Good Bacteria”. People are often confused because the use of antibiotics kills all bacteria in your system. Our product line does not utilize antibiotics of any kind nor is it ever ingested. Alcohol and alcohol products have ZERO persistence. In fact, all alcohol based products have only a few seconds to effectively kill germs. Alcohol products are extremely short-lived on the skin, as the alcohol evaporates quickly. Alcohol concentrations of at least 62% are required to act as an effective bacteria killer. When alcohol evaporates on your skin below 50% concentration, it is no longer considered by the FDA as an effective antibacterial. Alcohol is a solvent that extracts the natural oils from the skin, a process sometimes called “de-fatting.” Loss of these natural oils makes your skin dry cracked and inflexible. Thousands of small “micro” cracks are caused by each application of alcohol products. Yes. Alcohol at 62% to 67% will kill germs on your skin for approximately 5 seconds. However you will have no germ killing persistence going forward. In fact you most likely re-contaminate your skin when you touch the container cap to put it back on the product bottle. No. Our active ingredient benzethonium chloride is a Quaternary Ammonium Compound (QUAT). QUATS do not absorb into your epidermis, fats or deep tissue. Our product line has an active ingredient dilution of 0.2%. QUATS are very effective at low concentrations. The FDA specifies a concentration range of 0.1%-0.2% as safe and effective for benzethonium chloride when used as an active ingredient in first aid antiseptic products. All of the PureWorks products contain the powerful disinfectant active ingredients called quaternary ammonium compounds or “QUATS.” QUATS are positively charged molecules with relatively long hydrophobic “tails.” These molecules destroy bacteria by destroying their outer membranes and literally dissolving bacteria. At lower concentrations, QUATS interfere with normal membrane function, rapidly killing the bacteria. QUATS kill viruses by binding to their external coats, preventing normal function or even denaturing their protective coatings. QUATS are highly effective, quick-acting germicidal agents that are not toxic to humans or animals. No. Our products will actually help heal wounds and minimize scarring as they prevent the bacterial growth that causes infection. Additionally our products do no sting wounds. Our lotion is also an excellent non-foaming soap. It will not foam because the skin-conditioning components that enhance the feel of this soap are non-foaming ingredients. People who must wash their hands dozens of times each day enjoy using this “lotion-soap” because the more it is used, the better the skin feels. Also, people who experience skin irritation from traditional soaps should try using this non-foaming lotion-soap, as many customers have said that their skin actually improves when using this PureWorks product as compared to traditional soaps. The FDA requires that they are listed alphabetically on all compliant labels.